We played five years of Status Pro Baseball leagues. The first league was formed in 1979 using the 1978 teams. 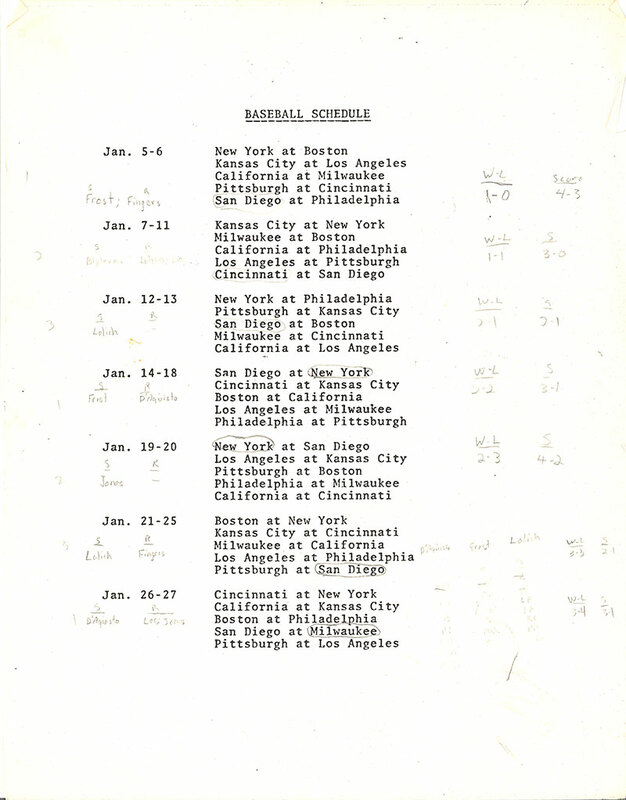 The actual games didn't start until after the Christmas break, so we officially kicked off in January 1980. I remember buying the game at the King's Crown, and then I mail ordered supplemental cards each year directly from Avalon Hill. Overall, the Status Pro Baseball leagues are pretty well documented, although the first two years are somewhat hazy as to the final winner. Thanks to Alan for keeping most of these notes, and maybe others will find old information to update this page as well. 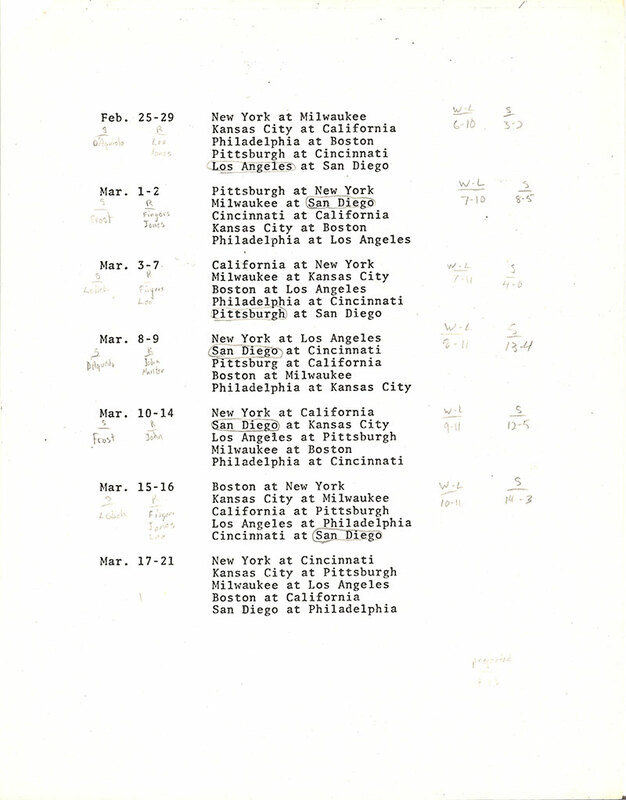 The schedule is shown below along with Alan's notes on how he did each game. Below are some general recollections of the game. 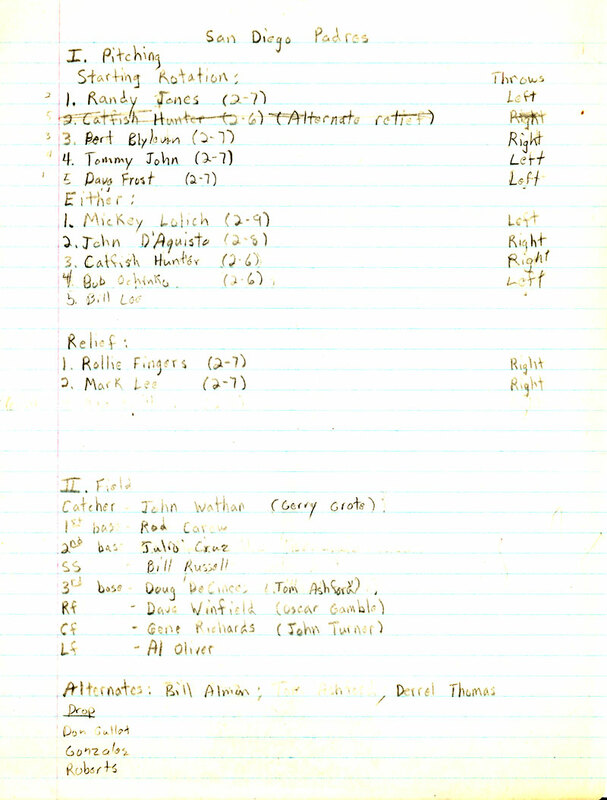 My notes showed I played the 1978 New York Yankees. 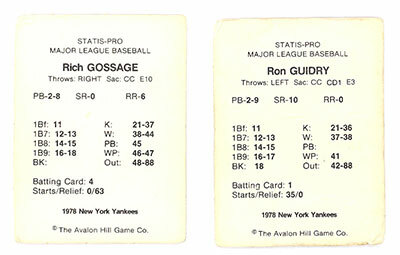 Ron Guidry and Goose Gossage were the bombs. 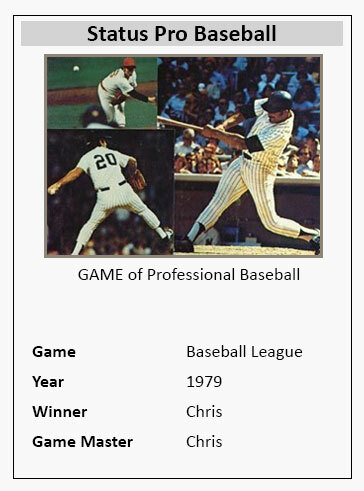 Although I ran the first couple of Status Pro Baseball leagues, it was really Mike Tapscott who pushed us to play the game - although I do remember some crazy discussions about trying to play a complete 162-game campaign. Several folks thought I won the league (despite no written evidence) - I obviously beat Alan (San Diego Padres) in our games. 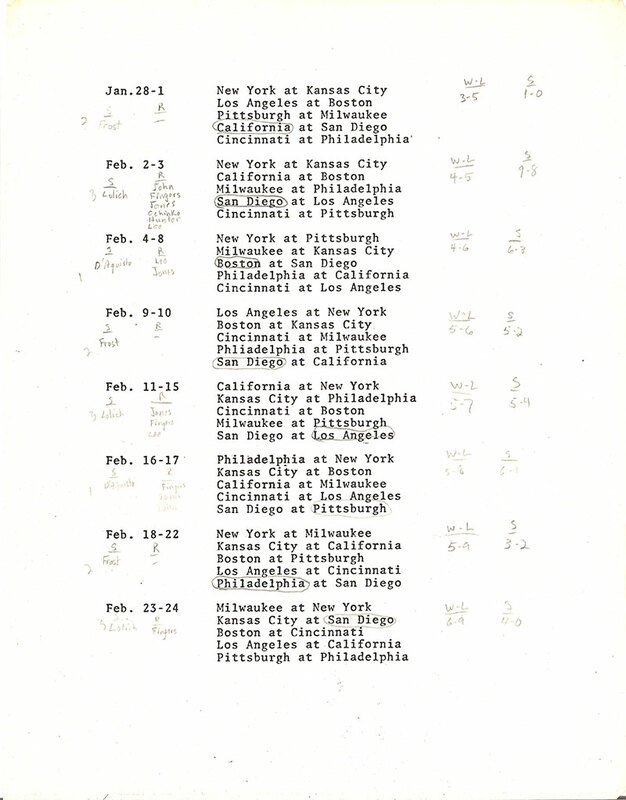 I "think" the players were: Chris (NY Yankees), Blake (KC), Tim (California), Doug (Milwaukee), Neil (Pittsburgh), Mike (Cincinnati), Alan (San Diego), Jeff (Boston), Bill (Los Angeles), and Rob/Andy??? (Philadelphia). After picking our teams, we did a supplemental draft to pick a few players - mostly to fill gaps and get superstars into the league. I remember doing the draft at Mike's house. My most vivid memory was when Alan drafted "J. Cruz". Mike asked whether it was the Seattle or Houston player. Alan ended up with meh Julio Cruz from Seattle while superstar Jose Cruz from Houston went to the next drafter. Classic. And, to make it better. 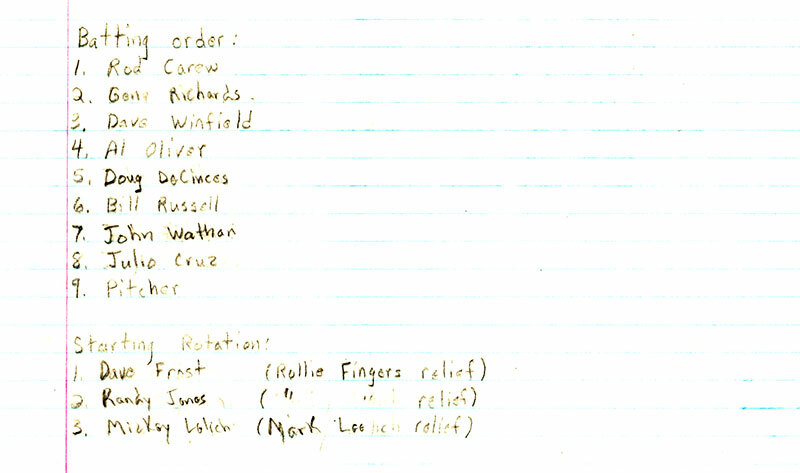 Alan still had a sheet with his lineup showing Julio Cruz - which I have faithfully appended to the bottom of this page.